CLICK images below if you wish to see larger views. An ogee is a curve, often used in molding, shaped with an S-Shaped profile. Or to create a pointed arch having on each side a reversed curve near the apex. Having roots in the Middle Eastern, ogee styles in architecture have however been popular over many periods in history in other countries. Variations have been placed in ancient Greek architecture, 14th and 15th century late Gothic styles in France and England and Roman before this. 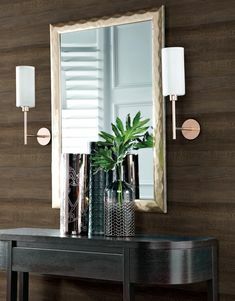 With wallpapers the ogee inspired designs can have modern retro look such as this one from Mirani. Or a strong Ogee pattern is achieved with the empty spaces between damask patterns as in the two following room settings. 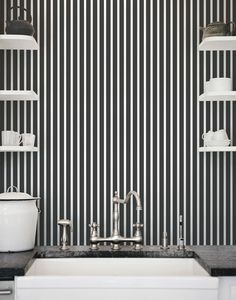 Another way of achieving a Ogee wallpaper design is with the creation of wave stripes. Not all designs are dark tones. Here is an interesting version with a thin grey Ogee line filled with a pink floral design. Some Trellis patterns are based on the Ogee curve. 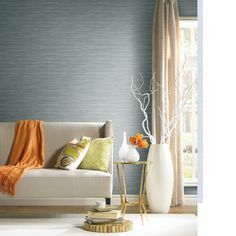 Not all Ogee Wallpapers are for living areas. These can be suitable for the light and airy decor used in baby nursery’s and children’s rooms. Ogee wallpapers can be super large beaded designs such as the Links pattern where you get a combination of shimmering gold and metallics for an extravagant feel. As you have seen there are loads of styles to pick from with designs influenced by the Ogee Design. To see the first lesson in Wallpaper designs see the post on damask designs.